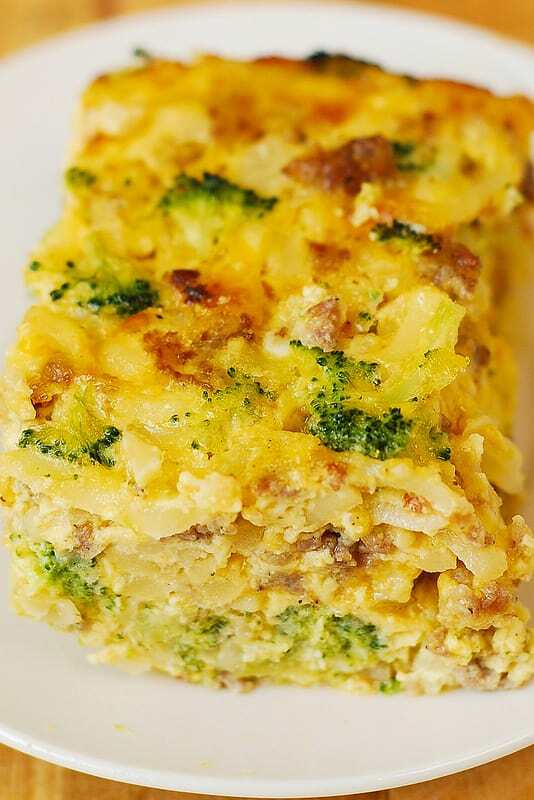 Sausage and Egg Breakfast Casserole with shredded hash brown potatoes, broccoli, cheddar cheese, sausage and eggs. 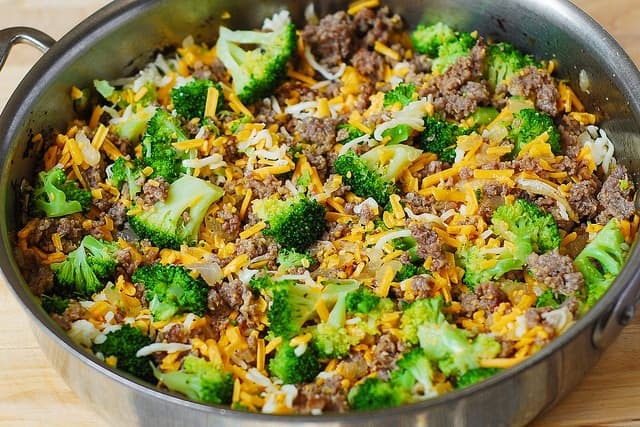 Everything you want to have for breakfast in one easy casserole! Very easy to make, and it’s gluten free! 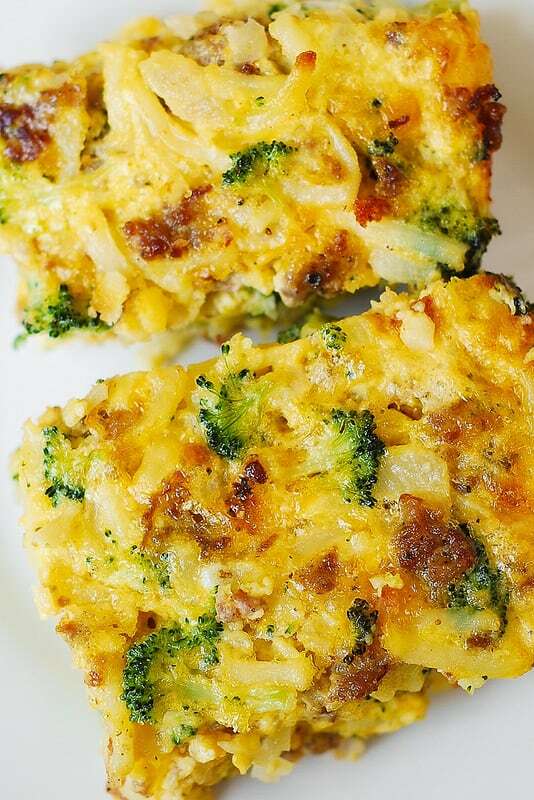 This Hash Brown, Broccoli, Sausage and Egg Breakfast Casserole is so easy to make. Just assemble everything in a medium size casserole dish and bake! 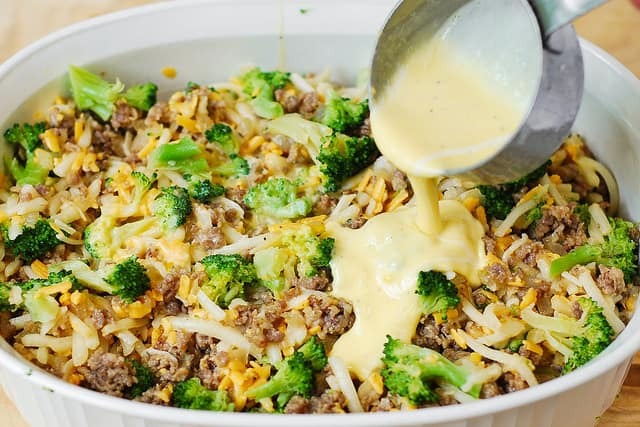 I love all the cheesy goodness, sausage and broccoli – perfect combination of flavors! 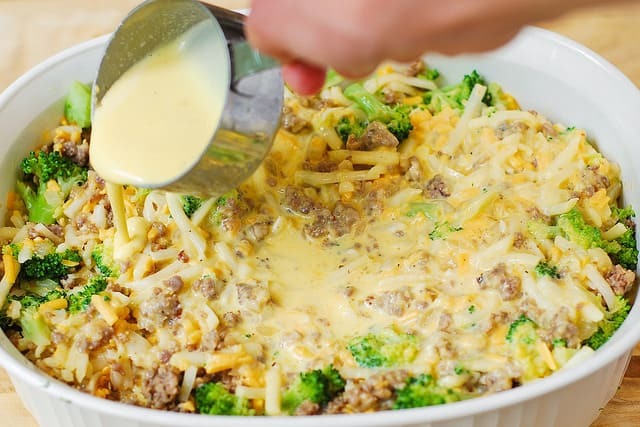 Below are step-by-step photos illustrating how to make this easy sausage and egg breakfast casserole. You will use 2 pans: a large skillet (to cook sausage in and combine all ingredients in) and a baking pan (to bake everything in the oven). 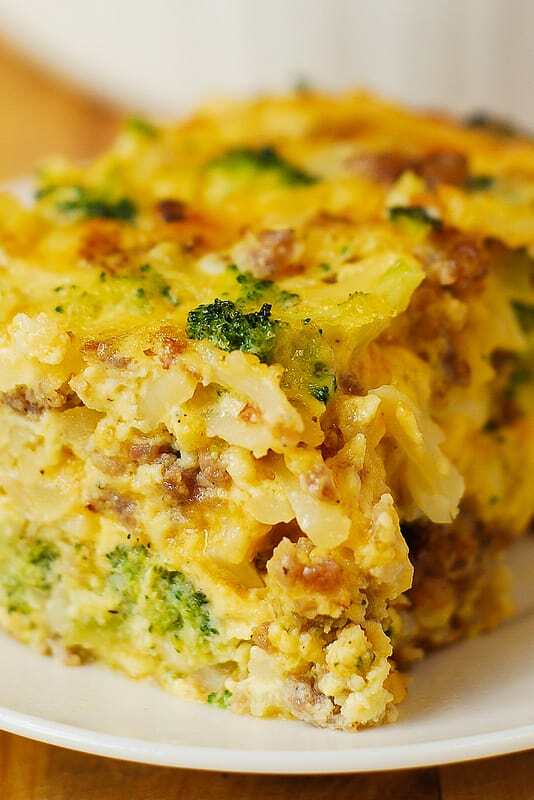 The photos are pretty much self-explanatory and the breakfast casserole recipe is super easy. If you have any questions, just ask in the comments section below! 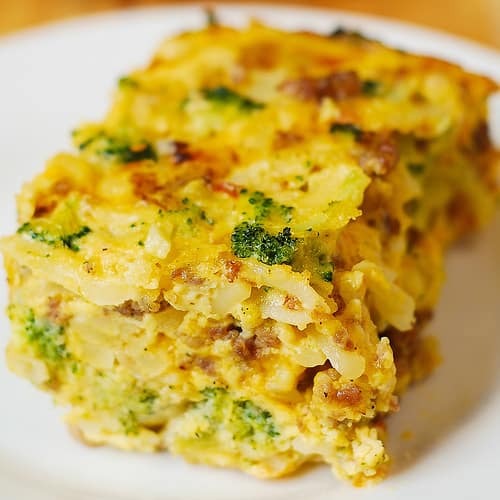 Enjoy a slice of this delicious breakfast casserole! 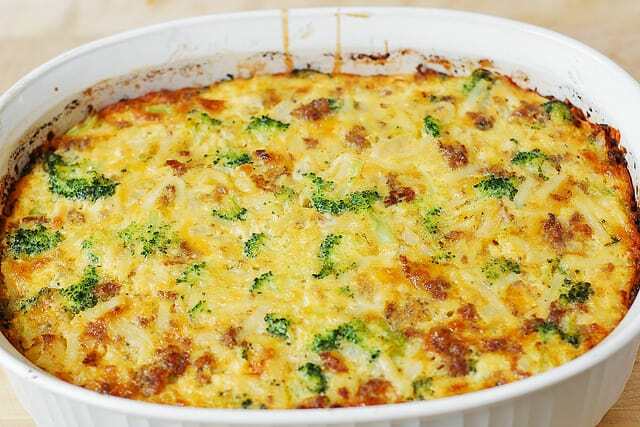 Sausage and Egg Breakfast Casserole with shredded hash brown potatoes, broccoli, cheddar cheese, sausage and eggs. 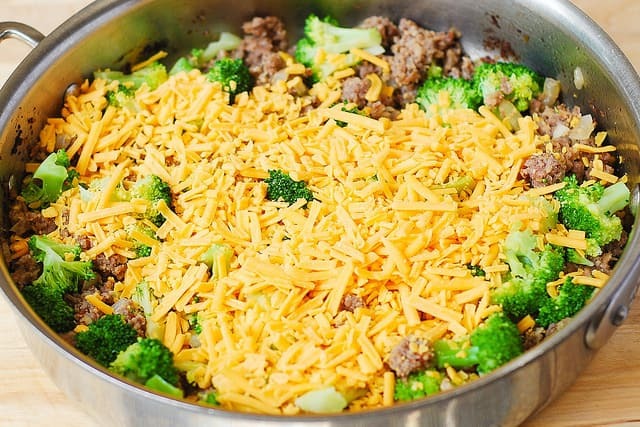 Everything you want to have for breakfast in one easy casserole! Very easy to make, and it's gluten free! Use 2.8 L (3 quarts) rectangular baking dish - 11 inches long x 8.5 inches wide x 3 inches deep. Brush the bottom and the sides of the baking pan with 1 tablespoon of melted butter. I would like to cook in a crock pot while we are at Mass on Eater morning. How long would you recommend cooking this using a crock pot? 2.5 hours on low? Love this! 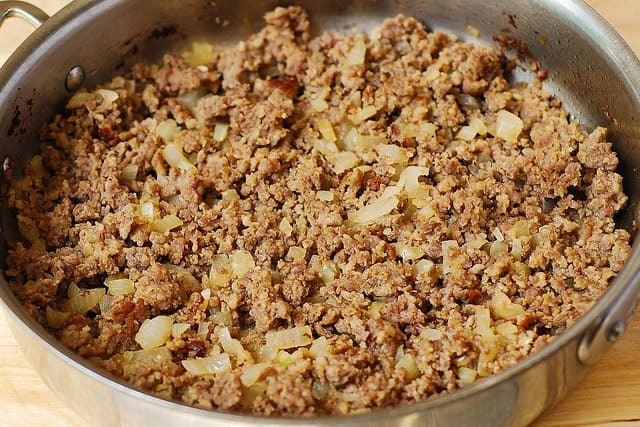 I use turkey sausage and skip the onions. Roasted the broccoli. A delicious dish. Can you confirm the calorie count? Seems high with 10 servings. This is ,my first time making this recipe, I added diced red pepper, we will see if I win the cook off contest at church ! Smells and looks very yummy ! So glad you’re making this recipe! Enjoy! I added red pepper flakes and substituted Swiss and gruyere cheese. Delicious. Adding red pepper flakes, Swiss and Gruyere cheese sounds so good! Great additions! Can this be made as muffins? Yes, you can use a muffin pan instead. Have you ever made this with almond milk instead of heavy cream? I am looking for a non-dairy modification (eliminating the cheese and substituting for the cream), and was hoping to use almond milk and add tomatoes as well. Coconut milk will probably be the better substitute for heavy cream in this recipe. Can I make it the night before? Yes, you can assemble the casserole the night before, cover it air-tight, keep it refrigerated, and then bake it the next day! DO you use frozen broccoli, cooked and drained? I used fresh broccoli that I cooked in boiling water.